The largest Island off the coast of New Zealand's North Island, 90kms north east of Auckland and in New Zealand and is a world away from the hustle & bustle of any city. (Aotea) Great Barrier Island is an Oasis for travellers, a replenishing place that promises both adventure and rejuvenation. The Island protects the Hauraki Gulf from the wild storms of the Pacific Ocean, hence its European name (Great Barrier), and its highly contrasting coastal environments. 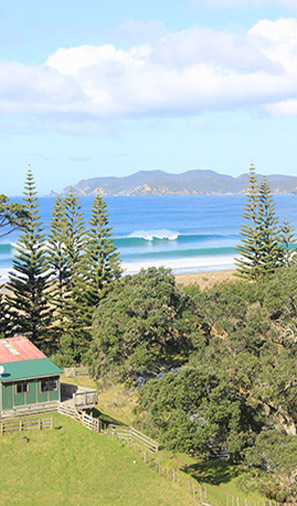 On the east coast (where the Shearers Quarters is located) there is sweeping beautiful white sand and surf beaches backed by tidal creeks and wetlands and the western coast is sheltered and calm with hundreds of tiny, secluded bays which offer some of the best diving and boating in the country. There are also spectacular bluffs and ridges rising to the highest peak Hirakimata or Mount Hobson, at 621 metres. Great Barrier Island is approx. 43kilometres long (north –south) and the current population sits around 800. Everyone still waves as you drive past. Great Barrier Island is a land rich in History from Kauri Timber milling and logging, Whaling and mining to its many notorious ship wrecks. We have literature available for you in the Shearers Quarters on these topics otherwise you can visit the museums & art galleries or speak to the locals. On Great Barrier we are aiming to minimise the waste making its way to our small landfill. We would appreciate your help with this by reducing the amount of packing you bring to the Island. Mobile phone coverage on the Island is limited. There is no cell phone coverage or wifi at the Shearers Quarters, however we will provide you with information on where to get it when you arrive. The Island boasts a fantastic medical team with a ‘Medical Centre’ in the Claris and a Rural Nurse outpost located in Port Fitzroy. It is also ‘off the grid’ powered by alternative energy power systems - mostly by generator or solar and as there is no street lighting and it is advisable that you carry a torch with you wherever you go. Great Barrier Island is also New Zealands newest Conservation Park, it is New Zealands largest area of possum-free forest. It is also free from many other animal pests that have taken their toll elsewhere in New Zealand, so please check your gear for any stowaways before you head to the Island. The regenerating forest has a healthy bird population and the most diverse range of native freshwater species of any offshore island in New Zealand. There are populations of very rare frogs, native paua slugs and over 13 species of lizard including the rarest, niho taniwha (chevron skink). Hirakimata and other high points in the centre of the island are the main nesting area for Black Petrel in New Zealand. Clean your dirty gear before you come, especially footwear, for soil and seeds—weeds are a serious problem. Dogs are also a risk to wildlife on the island, and are not permitted at the Shearers Quarters. ‘The Barrier’ is just one of those places you really need to get to in your lifetime. How many people have I spoken to who have said ‘oh The Barrier, yes, I’ve never been there but always wanted too’. The Barrier is definitely ‘a world of its own’ and will create a multitude of memories to take away, there is every chance you will encounter dolphins, whales, seals, octopus and other sea life as well as an abundance of native birds.